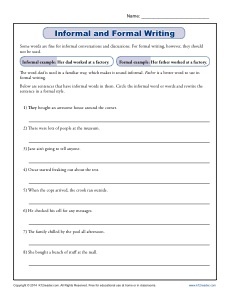 Many students find it difficult to switch from informal speech to formal writing. This worksheet is here to help! There are a variety of sentences that contain informal or slang words. Your student is asked to identify the words and rewrite the sentence. Perfect for Common Core Standards for 6th grade, you may also use it for other students as needed.